Short Business Description: User-friendly website and free catalog packed with high quality tools for greenhouse growers and serious home gardeners. A.M. Leonard offers a retail catalog and user friendly website that offers high quality products for the serious home gardener and professional grower. 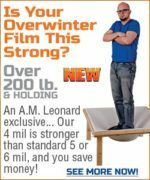 Our “Down to Earth Guarantee” says that if you are not satisfied with any standard stock item A.M. Leonard delivers, you may return it for your choice of refund or credit. Since 1892, the Logee-Martin family has been growing and selling over a thousand varieties of tropical container plants for home and garden. We are the exclusive source of many varieties, both heirloom and new introductions. Send for your Free Catalog. Short Business Description: The ARS mission is to produce unique, lightweight, precision cutting tools to minimize fatigue and promote gardening pleasure. Marquench hardened blades. This heat treating system produces very hard, very strong blades that register at the top of the Rockwell hardening scale. ARS blades are always ground, never filed. Every blade is sharpened to a knife-like edge.